Right click on the PDF logo, then Left click on "save target as" to download. 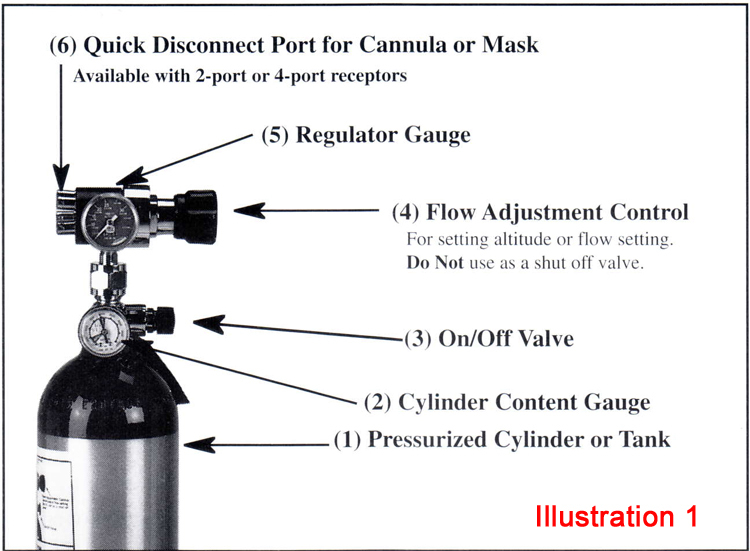 Referring to the Illustration 1 (click here to view), the portable oxygen system includes a cylinder or tank (1) with an On/Off Valve (2) a Regulator (3) a pressure gauge (4) with Indicator Gauge (5) followed by either a 2-port or 4-port Quick disconnect female receptor (6) that will accept a male fitting of a cannula or mask in each port. Units are shipped with two or four pendent style Oxymizer Cannula (see photo above right) and one mask. Mustache style cannulas may be substituted for pendent style cannula. The pendent style offers more freedom plus comfort and the ability to drink water, coffee, a can of soda, and/or to eat a sandwich. The size of tank you specify is based on projected flight hours of use, see Table 1 (click here to view) . Based on your order, the tank arrives either filled with oxygen or empty. If empty, the tank must be filled with aviator grade oxygen before using. Turn the On-Off Valve counterclockwise until fully on. Turn clockwise to shut it off. Check the tank's content level on the pressure supply gauge (2) (again, see Illustration 1). It is the gauge nearest the tank. This gauge will indicate how much oxygen remains in the tank. If the indicator needle is in the red area, the tank is getting very low on oxygen. If the indicator needle is all the way to 2,000 psi, the tank is full. (All tanks filled with 2000 psi). Activate the oxygen flow with the regulator control knob (4) (again, see Illustration 1) by turning it in. Directions are stamped on the end of knob as to which way to turn to increase or decrease the flow rate. Insert the quick disconnect element on the mask or cannula into an open port (6) (again, see Illustration 1) on the regulator head. 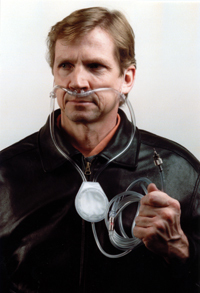 Oxygen will not flow until the fitting on the breathing devices is securely connected. The oxygen flow will stop when the cannula or mask is discon­nected from the port. It does not matter whether one, two, three or four cannula are connected, because only those connected will dispense oxygen. If you are using the Oxymizer Cannula, set it to the flow rate indicated on the Chart 1 (click here to view ) . 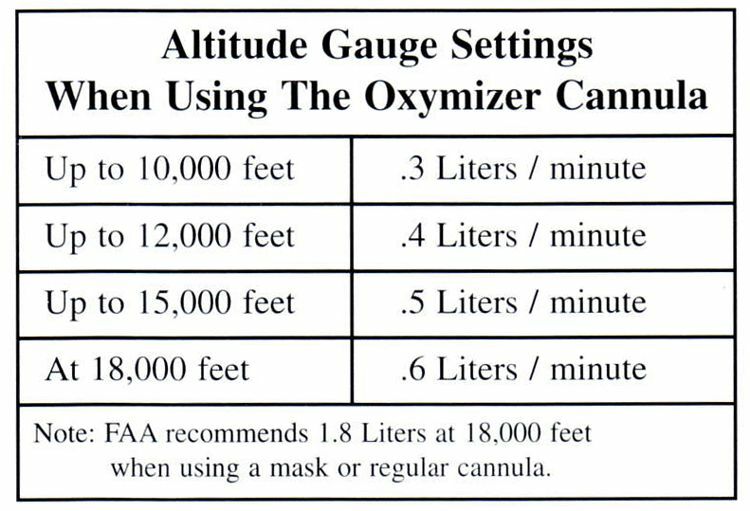 For simplicity purposes, it is recommended the guage be set at (.5 liters) for altitudes up to 15,000 feet. If you are flying at a lower altitude, you can adjust it downward, but the oxygen savings is insignificant by such an adjustment. (click here for Regulator Guage Example 1) . You do not need to adjust the regulator when multiple ports are being used. The regulator automatically compensates when additional (1-2 or 3) breathing units are attached. A setting of (.5) liters will deliver (.5) liters of oxygen from each port. If you are flying up to 18,000 feet, then set the flow rate at (.6) liters. A cannula (either a pendent or a mustache style) can be used only up to 18,000 ft. Above 18,000 you must switch over to a mask. 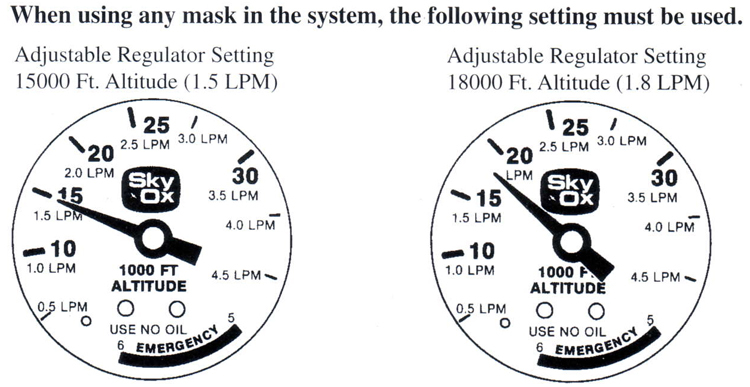 When using the mask, set the regulator gauge to the altitude you are flying. (10,000 - 15,000 - 20,000 - 25,000 feet) by turning the knob on the regulator until the gauge indicator is properly positioned (Click here to see Regulator Guage Example 2) . For an in-flight medical emergency, use the oxygen mask on the patient and adjust the flow meter to the emergency setting - wide open. This will provide a flow rate of five (5) to six (6) liters per minute. Radio ahead to request medical assistance, and land your plane as soon as possible.